Elverton Drive is a very distinctive place in the high hills, not so much for its houses—though no insult meant to their owners—as for its bedrock. From end to end, it offers the best exposures anywhere of the Claremont chert. If it weren’t for the parking situation, this would be a great spot for a class exercise in field mapping. The strata are clear, the winding road offers a range of orientations to refine measurements, and the rock isn’t totally uncomplicated. Take this spot. 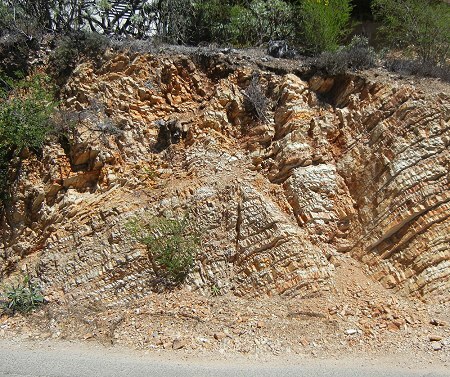 What is the nature of the change between neat rows and rumpled layers? What can the student conclude from the evidence, and what should the student look for elsewhere to test those conclusions? I don’t know; I’m just asking and I didn’t inspect this closely. Besides, it might be on someone’s homework. Near the road’s east end is an old excavation, perhaps a small quarry, where you could examine these rocks at leisure and collect a specimen. But do notice the presence of fallen blocks, and if you feel an earthquake while you’re there, step the hell back. East of Elverton, the chert crosses the ridgeline into the Huckleberry Preserve and trails into the back hills. 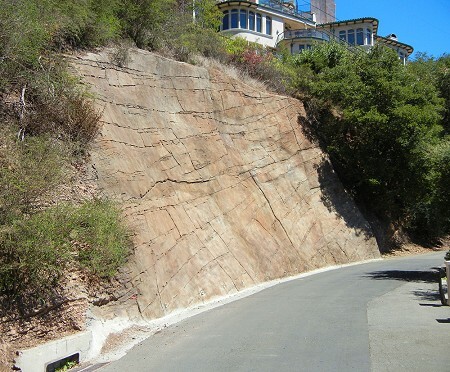 This entry was posted on 25 September 2013 at 10:25 am and is filed under Landslides, Oakland chert. You can follow any responses to this entry through the RSS 2.0 feed. You can skip to the end and leave a response. Pinging is currently not allowed. I sell real estate and drive up there quite a bit. Yes, the fallen rocks along the road side give me pause. Lack of parking is a problem but facing a car coming in the other direction can also be a major problem. The views are tremendous and most of the homes quite upscale and luxurious. The local communities love to cover up the good exposures. 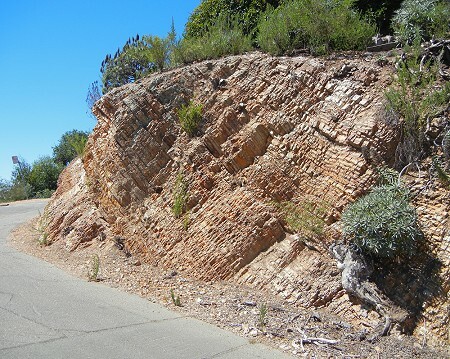 In Placerville they covered up a great exposure of the new melones fault.